We began our morning by drying off and (in some cases) taking some drastic measures to dry our shoes. We then moved into the discussion of the “What isn’t a linear relation?” sheet. We came up with some key features that linear relations have (e.g., the constant rate of increase or decrease). We also discussed proportions, and how to tell whether a linear relation is a proportion (in particular, the two quantities maintain the same ratio throughout the table). Andrew admitted to providing a “rule that expired” in checking only whether the two quantities were zero at the same time (this broke down in the octagon problem). We went down several side roads, including continuous vs discrete quantities, additive vs multiplicative comparisons, and how proportions are fundamentally multiplicative relationships. Seeley, C. (2014). Smarter than we think: More messages about math, teaching, and learning in the 21st century. Sausalito, CA: Math Solutions. Shumway, J. (2011). Number sense routines: Building numerical literacy every day in Grades K-3. Portland, ME: Stenhouse. Wright, R., Stanger, G., Stafford, A., & Martland, J. (2006). Teaching number in the classroom with 4-8 year-olds. London: Paul Chapman. 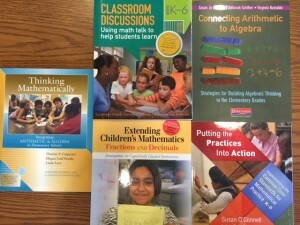 Van de Walle, J., Karp, K., & Bay-Williams, J. (2010). Elementary and middle school mathematics: Teaching developmentally (7th ed.). Boston: Allyn & Bacon. NCTM’s Navigating through…. .. (Part of the Principles and Standards for School Mathematics Navigations Series.) Go here for more info. After lunch, we used Andrew’s adaptation of the Candle Burning problem as an opportunity to discuss ideas related to tasks and cognitive demands, funneling vs. focusing, scaffolding, productive struggle, and curriculum materials. We moved into a discussion of equity and access by discussing last night’s reading from Principles to Actions and the graphic of kids standing on boxes. We concluded the pedagogy discussion by posting our grade-level tasks in a timeline on the wall. Then we worked on the “Fox’s Furniture Problem.” Andrew started by presenting the scenario without a given question, eliciting participants to ask questions that struck them. Participants worked on solving the problem and explore other possibilities. We found commutativity and associativity provide a way to justify why a “30%, then 10%” discount yields the same final price as a “10%, then 30%” discount. Terri showed how using a variable can demonstrate that the 40% discount will always be better than “10% then 30%” (or the other way), regardless of the original price. We ended by analyzing some students’ work to solve the problem, and judged them based on accuracy and efficiency. We found that a correct answer does not always imply a correct process, but also that a “weird” process is not necessarily inaccurate. We discussed how re-trying the purported method for another set of numbers can often reveal that the process is wrong, but also that trying just one more example might lead to a weird coincidence (as happened in class). Read the “Professionalism” section from Principles to Actions (pages 99-108). Review your materials from the past two weeks in preparation for the course evaluation (also the post-test, I guess). Enjoy your last evening in State College! This entry was posted in Daily Blog Recaps and tagged blog recap on July 30, 2015 by Andrea McCloskey. Using large posters, put one vocabulary term per sheet. Arrange the posters around the room. Give each student a set of small post-it notes. Have students visit each post-it, read what others have written, and add an idea, example, concept, etc. about that term. Once that process is complete, assign a small group of students to each poster and ask them to make categories out of the small sticky notes and be ready to talk about their categories as well as any sticky notes that they have a question about mathematical validity. Discuss the terms as a whole group. We then reviewed the homework by putting the answers on the document camera. We resumed our discussion of the Currency Conversion with Exchange Fee from yesterday afternoon. Those solutions are now available in the Google Drive folder. Problem 12 provided an opportunity to discuss algebra’s strategic advantage as a tool: equation-solving skills provide an efficient and precise method to solve inverse problems. We also explored the algebra behind finding the equation of the inverse relationship (given E, find D), and how one version of the formula can be manipulated to fall into the format y=[number]*x+[number]. With a computer doing the graphing for us, we could quickly manipulate those two numbers to see how changing those numbers changed the picture. We then used that discussion to segue into a discussion on the formal concepts of “slope,” “y-intercept,” and “x-intercept.” Andrew discussed a few misconceptions that he and Matt spotted on the posters from earlier. We broke from that discussion to dive back into problem-solving, this time with the Burning the Candle problem. Andrew rewrote the original version to remove scaffolding, which opened the question up to exploration and encouraged solvers to use methods that made the most sense to them. After lunch, we talked more about funneling and focusing questions, with Fran handing out an example of 2 conversations between Ms. Jones and Li – one where Ms. Jones uses a funneling pattern and one where she uses a focusing pattern. Then at their tables, teachers talked about their pedagogy homework – what they learned about their own questioning patterns. We switched gears and spent the last 25 minutes of the pedagogy time to find problems in textbooks that support students’ “floating capacity” for doing/undoing processes, rate, proportional reasoning, linear relationships, using multiple representations. After the pedagogy discussion, we returned to extract the “big ideas” from the Candle problem. The graph of height over time showed a line with negative slope, which was borne out by both the calculations involved and the geometry. We saw how there were multiple choices of how to measure time: one can measure with x=0 representing midnight, 1am, 10:30pm (when the candle was list), or other times. One could also measure x in hours or half-hours or minutes. It was found that letting x representing “hours after midnight” (e.g., x=0 is midnight, x=1 is 1am) provided a convenient way to converting between values of x and clock times. We then began exploring “What isn’t a linear relations?” This is intended to help isolate important (and incidental) features of linear relations and proportions. 2. Finish the activity we started in class: Using your textbook or curriculum guide, identify content at your grade level that supports the “floating capacity” for doing/undoing processes, rate, proportional reasoning, linear relationships, using multiple representations.Transfer problems to a piece of paper. 1. Return to the Kayaking Problem, Film Developing Problem (the original, not the variants), Currency Conversion without Exchange Fee, and Currency Conversion with Exchange Fee. Each involved comparing linear relationships. For each line involved describe each mathematical idea in terms of the original scenario. Specify units. This entry was posted in Daily Blog Recaps, Uncategorized and tagged blog recap on July 29, 2015 by Fran Arbaugh. Putting the Practices into Action: Implementing the Common Core Standards for Mathematical Practice K-8 by Susan O’Connell and John SanGiovanni. (www.heinemann.com). We went deep into the homework on processes, comparing answers and pulling out some solid lessons on how to invert multi-step processes. Along the way we also established the convention that a number-based process is most generally written by using a single-letter variable as the initial input. Jen also made the connection between finding inverses and fact families: effectively we have a two-member fact family when we write a process and its inverse. After the break we finished the discussion of the rice-and-water problem and how inverses play out there. The original problem asked “Given R cups of rice, how many (W) cups of water do we need?” The inverse problem asked “Given W cups of water, how many (R) cups of rice can that make?” We ultimately came up with formulas for converting between R and W in terms of multiplying by a rate (the exact number we multiplied was 5/3 or 3/5 depending on whether we started knowing R or W). By drawing both relations on the same axes (with different sets of labels), we drew an important geometric connection between a proportional relationship and its inverse. Specifically, the graph of the inverse formula looks like the reflection across the line y=x (which can also be seen as the 45-degree line when two axes have the same scale, also the line through (1,1), (2,2), (3,3), etc). The remainder of the math discussions (morning and afternoon) centered around the problems in Unit FA-3 on Currency Conversion, both with and without an exchange rate. This provides a vivid contrast between proportions (without exchange rate) and the more general idea of a linear relationship (with exchange rate. The pedagogy discussions centered around “focusing versus funneling” question styles, and using student knowledge to guide your process. After a discussion of what these terms mean, participants broke into pairs and engaged in role-playing exercises. Partners recorded themselves as they took turns acting as students (who made errors) and their teacher. The homework is to listen to one’s turn as teacher and analyze one’s teaching style. Read pages FA3.9 to 10, on the terminology of linear relationships. Listen to the audio-recording of your teaching episode. In your notebook, write down the questions that you asked. Were your questions funneling or focusing questions? How might you change your questions now? What types of questions might be more productive for eliciting student thinking? Write a few new questions based on the 4 questions types on page 36 and 37. Also: Tomorrow (Wednesday) we will be getting into your textbooks. Please bring materials to look at! Percolation assignment: When is it “ok” to use funneling questions? 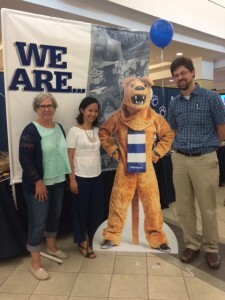 This entry was posted in Daily Blog Recaps and tagged blog recap on July 28, 2015 by Fran Arbaugh. Welcome back to week 2! …walked the graph. Fran had us up and about trying to imitated a time-vs-distance graph by using her Ti-84 calculator and a motion detector. We touched on a lot of ideas that will show again this week, although in less formality. During discussion we saw how distance from the detector, speed of motion, and direction of motion could all be visible in the graph. …learned about processes in Unit FA-1. We started with how a process can correspond to a step of a larger procedure. We then transitioned into invertible processes (and processes that could not be inverted), multistep processes, and then viewing algebraic expressions as the results of performing processes. …talked math and talked about talking math. …reasoned about proportions via examples in Unit FA-2. We worked through the feet-inches conversion, and then started on the rice and water problem. Completing the second half (on the inverse) is homework. “Problems on Processes and Inverse Processes” (FA1.10), problems 1ade, 2(all), and 3(all). Complete the Rice and Water: The Inverse Relation problems on FA2.11-12. Challenge yourself to draw connections to the feet-and-inches conversion problem. Look at Maddie’s work and Gabe’s work, shown in figure 22 on page 55. How could Ms. Lewis leverage the students’ representations to develop Maddie’s understanding of the problem? This entry was posted in Daily Blog Recaps on July 27, 2015 by Andrew Baxter. Today we began by “jigsawing” the homework problems from last night. Teachers were assigned to “expert groups” on one of the problems: partitive vs. quotitive division, changing perimeters of a rectangle with fixed area, and the handshake problem. Experts formed new groups to discuss the problems further. Andrew showed us how the graph of y = 24/x (a hyperbola) can help thinking about changing the dimensions for a fixed area. We watched a video of 3rd graders working on the handshake problem (mini Gausses!) We also heard some great ideas from colleagues about effective ways to organize students into groups and to provide extra work for groups of students who finish early and need differentiated learning opportunities. We discussed many models to understand fractions from a variety of perspectives, not just the “pizza model.” In particular we found that many of us overlook using fractions as distances or locations on the number line, but these other models can be of great use when justifying fraction arithmetic. We used the area model to expand our ideas about equivalent fractions and fraction multiplication. We also drew on the adjective-noun theme to justify the process of finding a common denominator. We sat in a circle and practiced one another’s names. We discussed productive classroom norms regarding engaging in mathematical problem solving, participating as productive group members, and what strategies teachers can use to help establish such norms. After a lunch and picture-taking break, we resumed work with fractions. We discussed why division of fractions should involve multiplying by the reciprocal. In short we did it by the same way we came to understand division yesterday: translating a division problem with an unknown result into a multiplication with an unknown factor. We ended by working on the sheet about estimating fractions, and developing fraction number sense. We said good-bye to our colleagues who won’t be joining us next week! We’ll miss you, and we hope to see you next summer if not before! No HW, but please bring as many of your curriculum materials as you can on Monday. We’ll be re-examining your textbooks together. But…..if you’re looking for some math to do: How many names were said when we played the name game? That is: by the time we had made it around the whole circle and each of us had taken a turn, how many names had been uttered? Hmmm……. This entry was posted in Daily Blog Recaps and tagged blog recap on July 24, 2015 by Andrea McCloskey. We started the morning by making posters for the 8 “rules that expire” and having a short discussion about those rules. We handed out the article “13 Rules that Expire” from Teaching Children Mathematics. (Don’t forget that the “Nix the Tricks” download is available on our Google folder. You can also visit the website and submit your own ideas for “tricks” or “vocabulary” that can be problematic when teaching children.) Then teachers discussed their addition and subtraction with signed numbers word problems that they wrote for HW last night. We began the math discussion by wrapping up a loose end from yesterday. We used skip-counting and pattern recognition to justify the rules of sign for multiplication. We then moved into Unit 5 on Division. The first major idea is the dependence of division upon multiplication, like how subtraction is depended upon addition. 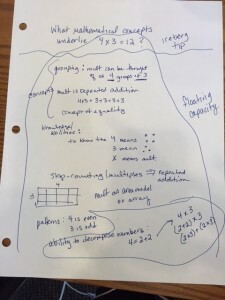 This has two ramifications: (1) a student’s mastery of multiplication has direct bearing on their potential to master division, and (2) we can justify properties of division by relating it to a corresponding multiplication problem. We explored item (2) in depth as we saw why division by zero is problematic. We skipped over the “Rules of Sign for Division” (page 5.10), but they are based directly on the rules of sign for multiplication. We also had a side trip where we discussed how subtraction and division fail to be associative. Just before lunch, Andrea shared a worksheet presenting several alternative algorithms for multiplication. We explored lattice multiplication and discussed how place value and the distributive property play out in that representation. You are encouraged to explore any of the other algorithms shared on that page. Bonus points if you can explain the Russian Peasant method! We also spent some time exploring rate calculations and the adjective-noun theme for division. The website that expands the adjective-noun theme throughout the K-8 curriculum is: http://www.adjectivenounmath.com/. We will look at rates and unit conversion is more depth in Functions and Algebra. After lunch, we had small group and then large group discussion of the pedagogy HW from last night. After a small-group discussion, we compiled teachers’ impressions of the beliefs about teaching and learning that they inferred for Ms. R and Ms. F from the reading. The teachers then talked in their groups about “things teachers can do to promote productive struggle in math class” and we compiled those as a whole group (we will continue to add to this list of strategies and then post the final list in the google folder at the end of next week). 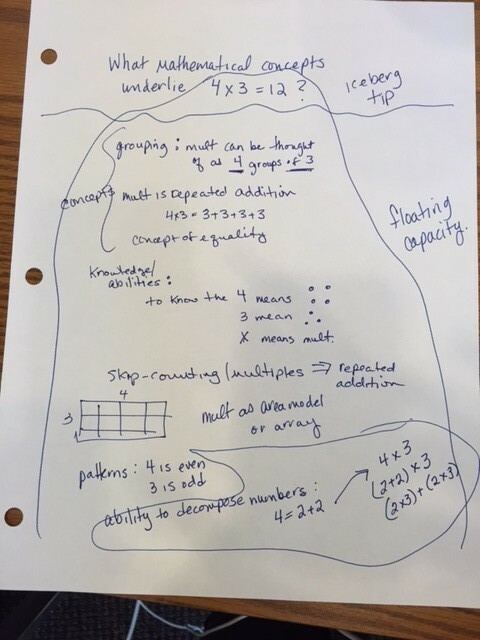 Fran then shared her work from the Library Fines problem from yesterday – modeling productive struggle (she went down a number of dead end pathways, used a number of different representations – pictures, numbers, expressions). 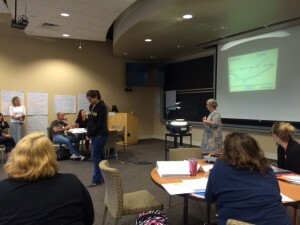 At the very end, Fran and Andrea discussed the Common Core Standards for Mathematical Practice. Problem 6 from “Practice Problems for Division,” page 5.16. Actually making the paper rectangle is optional. The handshake problem. Problem 5, page 2.11. As a community, we have focused on establishing a number of norms (ways of working) this week. We have also focused on a few messages about the learning and teaching of mathematics. In your notebook, please write a response to the following prompts from your perspective as a PMI workshop participant. There are no right or wrong answers to these prompts – we want you to respond from your perspective. This entry was posted in Daily Blog Recaps and tagged blog recap on July 23, 2015 by Fran Arbaugh. We began the morning with teachers filling out the HW chart (Choosing Problems for HW Review on the HW Review Strategies list we’ll hand out at the end of the workshop). Teachers found a partner that they had not worked with already this week and compared/contrasted HW solutions. After the homework review we moved into a discussion of signed numbers. We explored how our models of addition and subtraction, particularly the chip model and number line models, extend to signed numbers. We found that viewing subtraction as missing-addend addition (e.g., translating “a-b=[what? ]” into “b + [what?] = a”) is very productive viewpoint when signed numbers are involved. As a side diversion we discussed pitfalls of the word “cancellation,” and how that gives students trouble later in algebra. After lunch, we talked about conceptual understanding and procedural fluency (last night’s reading assignment). Fran led the group in making an iceberg model for 3X4=12. We then moved into Unit 4 and discussed multiplication and the distributive property. We started with three models of multiplication: repeated addition, skip counting, and area. We saw how repeated addition can give rise to each of the other models. We also discussed how each model has its own limitations and strengths. We then used those models to help us understand why the commutative and associative properties are true for multiplication, as well as why 1 and 0 have the multiplicative properties that they do. We also discussed how the distributive property describes the interaction of multiplication and addition, and applied it to calculations. We briefly connected “pulling out common factors” to reading the distributive property in reverse. We also looked at how the distributive rule works more generally than what FOIL (“First Inner Outer Last”) can describe. Read pages 3.28-3.32 on the opposite of a number and how it can be useful. This likely matches with whatever you remember of how to add and subtract signed numbers. Write word problems whose calculations involve the sums on page 3.24. Try to do the same for the subtraction calculations on page 3.27. Read Principles to Action, the section titled “Support Productive Struggle in Learning Mathematics” (p. 48-52). This entry was posted in Daily Blog Recaps and tagged blog recap on July 22, 2015 by Fran Arbaugh. Welcome to the 2015 PMI Workshops! We begin with a welcome from the group: Andrew Baxter, Fran Arbaugh, Andrea McCloskey, Charles Helou, and Beth Lindsey. We also had a welcome from Math Department Chair Yuxi Zheng. We then dove into the Kayaking on the Susquehanna River problem, and discussed (1) the issue of ambiguity in a written problem, (2) the multiple modes of solution, (3) how those solutions can relate to each other, and (4) how different methods have different advantages and disadvantages. For example, the algebraic method was fast but without extra work it did not answer the more practical question of how to decide between venues for other lengths of time. After the break, we spent the rest of the morning on the pre-assessment. After lunch we discussed the “Smarter Than We Think” article. Then we read the beliefs chart on page 11 of Principles to Action and had small group discussions about our own beliefs about teaching and learning mathematics. We will continue to discuss the ideas of a “growth mindset” and “fixed mindset” as the weeks go on. We finished Unit 1, discussing what equality should mean, and how students misunderstand it. We also began Unit 2 by discussing the adjective-noun theme and how it applies to addition. We then applied the adjective-noun theme to see how it makes sense of the place-value system in addition and adding fractions with a common denominator. Adding it Up: Helping Children Learn Mathematics, National Research Council (2001, p. 116). Focus on problems 1 and 2. Attempt at least two of the three variations in problems 3, 4, and 5, as time permits. Optional: The riddles from Unit 1, and Guess My Noun from Unit 2. Section titled “Implement Tasks that Promote Reasoning and Problem Solving” (pages 17-24). Reflect on a typical in-class math lesson (use your textbook to refresh your memory) that you have taught. Using the descriptions of Levels of Cognitive Demand in Figure 3 (p. 18), describe the types of mathematical thinking your students are required to engage in during a typical lesson. 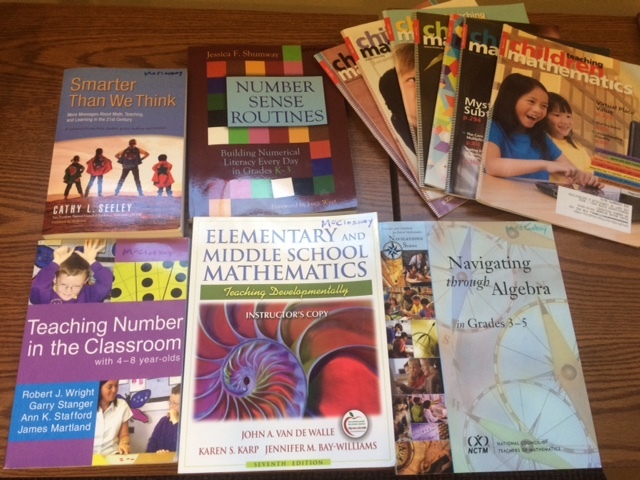 Bring your math textbooks to PMI on Tuesday. This entry was posted in Daily Blog Recaps and tagged blog recap on July 20, 2015 by Andrew Baxter. Another fantastic day of geometry! We started the day going over answers from the Quadrilateral Identification Task as a group, then each table compared notes on the Portfolio of counter-examples. Each table had fruitful discussions in separate directions. Andrew raised the issue of how the word “base” gets used differently depending on context: it could be the non-congruent side in an isosceles triangle, one of the two parallel sides in a trapezoid, or “a designated side” that the height is drawn from (Thanks, Jennifer Gilbert for bringing her classroom materials.). Block 5 expands the view of “flip, turn slide” into a larger framework of transformations. We settled back down to reflections (flips), rotations (turns), and translations (slides) because they are nice: they do not change the length of segments and they do not change angles. We called such transformations rigid motions, since they treat the shape as unstretchable and unbendable. We then spent a lot of time using patty paper to explore reflections, rotations, and translations and what happens when you perform them in succession. In general, we found that the order in which rigid motions are applies matters. Doing A, then B will produce a different net result than doing B then A. There were special instances (such as rotating about the same pivot) where order did not matter, but the default is that order does matter. Block 6 expands our usual view of symmetry into a broader context through transformations. The usual mirror symmetry can be viewed as reflection symmetry: performing a reflection about the line of the mirror produces an image identical to the original figure (“you can’t tell anything happened”). In the end we said a figure could be called “symmetric” if there is some rigid motion that preserves the figure (i.e., the end image is the same as the original figure). This means a figure like a capital S has rotational symmetry about the center. We had a good discussion about how many people (adults and students) want a [non-special] parallelogram to have mirror symmetry, either about a diagonal or some other line through the center. Andrew’s theory is that they see a “same-ness” on each end, but it is a “same-ness” based on rotation and not reflection. However, the untrained eye cannot tell the difference, and if you only know about reflection symmetry you assume that the same-ness you see can be explained by a mirror. We did notice one important connection between reflection symmetry and rotation symmetry: if a figure has mirror lines, then it will also have rotational symmetry about the point where those mirror lines cross. Going further, the number of mirror lines gives the order of rotational symmetry (e.g., the regular pentagon has 5 mirrors and 5-fold rotational symmetry). We skipped many handouts from this block, everything from 6-8 onward. If it looks interesting and you’d like more guidance on the matter, see the “EscherMath” link in Miscellany. Shaun put together a nice exploration of where area formulas come from. We used the area of a rectangle as a baseline, which is a natural and easy to understand formula. We then explored other shapes’ area formulas, trying to connect them back to previously-discussed shapes. We found a way to “rectangle-ify” a parallelogram, “parallelogram-ify” a triangle, and so on. Our major tools were (1) cut off a piece of the region and move it via a rigid motion, and (2) duplicate the shape (or a part of the shape), move that clone to make a “big” shape whose area we know, and then take half of the area of the big shape. In this way we connected transformations with area formulas. Justifying area formulas is definitely a place where there is more than one right way to do it. Patty paper can be purchased at Amazon (and elsewhere). The PBS show with early-grades math content that Andrew mentioned is Peg+Cat. It is honestly Andrew’s favorite kids’ show. They have a whole song about how there is more than one way to solve a problem, and another about persisting in solving a problem. Episodes are available on pbskis.org, Netflix, Hulu+, and Amazon Prime. There was a general education course offered at St. Louis University on the mathematics of M.C. Escher. There is a lot of material there on transformation, symmetry, and tessellations. Their course materials are online at http://mathcs.slu.edu/escher/index.php/Math_and_the_Art_of_M._C._Escher. They include a lot of activities, too. [UPDATE 7/10/15]: Solutions for the portfolio of counter-examples, along with commentary, now available. Email Andrew at baxter@math.psu.edu if there are other questions. This entry was posted in Daily Blog Recaps on July 7, 2015 by Andrew Baxter.